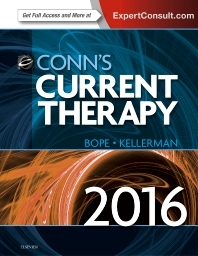 Designed for busy medical practitioners who need a trustworthy, current, and easy-to-use resource, Conn’s Current Therapy 2016 focuses solely on up-to-date treatment protocols for the most common complaints, acute diseases, and chronic illnesses. Covering more than 300 topics, Drs. Edward T. Bope and Rick D. Kellerman present the expertise and knowledge of hundreds of skilled international leaders on evidence-based clinical management options, ensuring you're well equipped with the practical and accurate guidance needed for effective patient care. Includes PharmD review of newly approved drugs. Brand-new chapters cover Ebola, Chikungunya, dry eye, and adolescent health. In addition to current therapy, each chapter also features important diagnostic criteria to ensure delivery of the correct diagnosis and treatment. Table of contents is divided into sections based on organ system, according to prevalence in primary care populations. Section on symptoms is devoted to common patient complaints.